Comments: Reverend James E. Daniel came to Scottsville with his wife and son in about 1920. 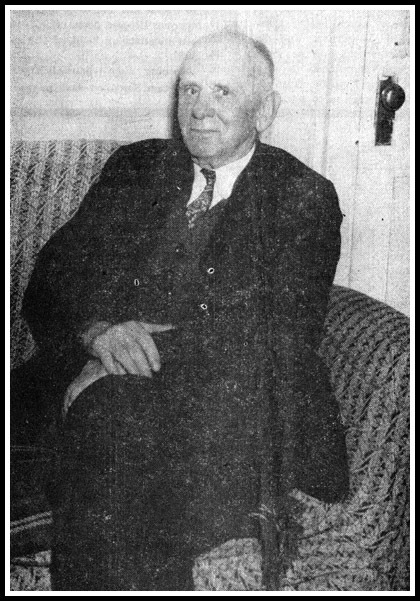 He served as pastor of the Scottsville Methodist Church until ill health forced him to retire in 1925. Although officially in an inactive status, Rev. Daniel officiated at countless weddings, baptisms, and funerals in the years that followed. When this photograph was taken in 1951 for publication in the Scottsville Sun, he was very active in church ministry. In his spare time, Rev. Daniel loved gardening and long walks with 'Peachy,' his fox terrier. Rev. Daniel studied for the Methodist ministry at Randolph-Macon College in Ashland, Virginia. Prior to his ministry at Scottsville Methodist Church, Rev. Daniel served as a pastor in Maryland and in the Virginia counties of Chesterfield, Amelia, and Buckingham. After his health forced him to retire as a full time minister at Scottsville Methodist Church, Rev. Daniel remained a staunch supporter of the church. He served as its backup minister and taught a weekly Bible class there through the mid-1950's. Nobody around Scottsville, who knows the Rev. James Ellison Daniel, could exactly say that he has gone into retirement, although he was superannuated by the Methodist Church and forced to retire from his post as pastor here because of ill health back in 1925. A more active 'retired' man would be hard to find. Mr. Daniel served the Scottsville charge as pastor for five years, coming here with his wife and son about 1920. Since he became officially inactive, however, he has been busy serving as friend and counsellor to many, and has officiated at countless weddings, baptisms, and funerals. He jokingly observes that he is Mr. Taylor's (the present Methodist pastor) "junior preacher." Still a staunch supporter of his church, he has been teaching Bible class ever since his retirement. He is also in demand for services at churches of other denominations and in surrounding communities. A friend to all, one of his favorite pastimes, he admits, is talking to people. He also enjoys long walks with his pet, a small but vigorous fox terrier named Peachy. Gardening is another one of Mr. Daniel's hobbies, and he is able to produce an amazing quantity of vegetables from his 30 by 40 foot plot in his backyard. This fall he not only was able to supply his household plenty of vegetables but sold $27 worth of butter beans. Butter beans, he says, are his specialty. He also raised enough tomatoes for Mrs. Daniel to can without having to buy any. Mr. Daniel was born in Middlesex County and attended the usual one-room school during his early years, walking to it from his father's farm. He then attended Chesapeake Academy at Irvington where he received a high school education, and then went to Randolph-Macon College to study for the ministry. While a student at Randolph-Macon, he served as junior preacher in his spare time at La Plata, Md. His first charge was in Chesterfield, and from there he moved to Amelia and then to Buckingham charge. Scottsville has claimed him ever since. The Daniels have one son, Ragland, who is employed in the Scottsville Post Office. Observing that when he started preaching, the church was filled to overflowing, while nowadays it is rarely filled to capacity. Mr. Daniel said that people have too many other things to do now while in the old days, they went to church because there was nowhere else to go. Intensely human, with a sparkling sense of humor, Mr. Daniel is a fine example of Christian warmth and friendliness. The photograph of Reverend Daniel is from the collection of Robert Spencer. Bob resides in Scottsville, Virginia.